We keep some of our casebound menu covers in stock at all times, so you don't have to settle for sub-par covers when you make those last-minute orders. Each cover is made of matte-finished leatherette bound to tear-resistant bookbinders' cloth. Rigid boards make it easy for customers to prop up the menus and make their selections. Slip one to four pages of food and drink options into album-style diagonal corners, and add clear vinyl sheets for extra protection. 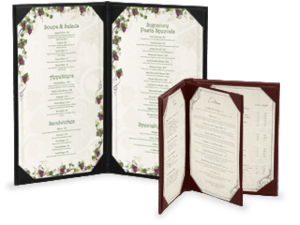 Our casebound imitation leather menu covers are classic choices for sit-down restaurant that want to stick to the basics. These menus are simple but durable, with hardy details and stain-resistant materials from the inside out. Just mix a drop of mild dish soap with six ounces of tap water to remove sticky residue and hardened food particles, and wipe the menu covers down with damp washcloths or towels in between meals. Ten different sizes are ready to assemble and ship immediately, and other configurations will only take one to two weeks. Quick ship menu covers are available in three types: single, double, and triple booklet-style menu covers. Our in-stock casebound menu covers are available in two colors: midnight black or burgundy wine. Most of the black covers are available immediately, but ask us about our current stock if you prefer burgundy. Budget-friendly. We sell our casebound covers at wholesale prices, too. Save $2-3 on each cover by ordering 25 or more at a time. When you need budget-friendly menu covers at the last minute, we have you (and your menus) covered. Our in-stock casebound options are perfect for protecting your paper in a pinch, especially when fancy details and personalized covers are unnecessary for your brand. Just place an order now to claim some of our ready-to-assemble casebound leatherette covers. Do you have high standards for your menu covers but need them quickly? 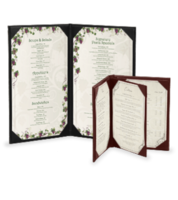 Try our quick ship casebound menu covers that are ready for immediate shipping.